Read our customers' honest and impartial Jaguar XF car reviews and ratings to easily find your next car at Motorparks. I originally was looking at the XE, but, when I saw the inside of the XF, in my opinion the XF was way out in front. Lots of toys. Performance excellent. The colour is metallic white - I think I have made my neighbours jealous. Thank you Grange Motors of Brentwood. Jaguar XF Portfolio 2.2 200bhp in Dark Sapphire with Ivory trim looks stunning in my opinion. The car drives and feels as good as it looks... Brilliant. This being the first Jaguar I have owned, I am absolutely delighted with everything about it. It's a superb car and a joy to drive... it's everything Mike Kimberley our salesman said it would be. I have wanted a Jaguar XF since they were first released and I can honestly say that having now got one, I am not disappointed and wish I had bought one earlier! Excellent car in all respects! Excellent car, probably one of the best I have ever had I am 77 so that's saying a lot! Excellent car, very well presented by Grange Welwyn. Extremely comfortable and proud to own it. I love my new Jaguar XF, it's lovely to drive, it looks good - Highly recommend the Jaguar XF R Sport - you won't be disappointed. I've just purchased a Jaguar 3.0 litre V6 Twin Turbocharged Diesel 300PS. It's my first Jaguar and in the short time that I've had it I could not be happier with my purchase. Where do I start, it's comfortable, has every conceivable extra that I could ever need or want. The performance is fantastic, steering is precise with just the right amount of driver feed back. The suspension feels more like a sports car than a four door saloon. It corners brilliantly and goes just where you want it to. I'm getting around 43mpg Urban Fuel Economy and approx 64mpg when cruising at around 60mph. All in all the XF S is a fabulous car. I have been delighted with the car. Very good performance, an extremely comfortable ride and very positive road handling. Like all new versions of a model there are some things that you like and some you do not. Overall I think that the ride and handling of the new XF is a definite step up from the old model. I now drive the 2.0 litre but with the same engine rating as the previous 3.0 litre. There was no discernible difference in performance. I have driven the 2.0 litre with lower rating 180 HP but found it disappointing. Altogether I am very pleased with my purchase. I have a Jaguar XF 2.0 R-Sport - it is quick and very responsive. The interior is of high quality and well laid out as Jaguars have always been. Very, very pleased with my purchase and will buy again in future. My only criticism is lack of view over the right shoulder, only for that I would have scored it a 10 - best car I have had. I absolutely love this car - the XF Sportbrake 3.0l. I went from a Mercedes Benz E250 to this and it is significantly better all round than the Mercedes. It is more comfortable, more responsive, more agile and drives so much better. Could not recommend this car high enough. It is a great drive. Having driven Jaguars for over 10 years now this XF is by far the most positive in response and comfort. The only downside I have is I believe being a diesel when I turn off the engine I lose power to the music / radio. I have been waiting and I have always wanted a Jaguar and now finally I can say I have one. This is a great car as everything you want within a car which is pure luxury and I have had so many comments and lots of admiring looks. I would also like to say a personal thanks to Gavin and Ralph for making the whole process a great experience. I have had cars from Ford and Vauxhall but they do not compare to Jaguar. This is truly a great car and I am very proud to drive it thank you. Kind Regards, Morris. The performance is very good, reacts instantly at all speeds. The road noise is excessive, probably due to the aluminium construction. The chrome door surround off side does not line up, this is not acceptable for a car of this price. My XF Portfolio is an excellent car to drive, very comfortable and extremely quiet. It's a very good buy. This is my second XF and while I loved the previous car, this one is at another level. It has the 3.0 V6 diesel engine that seems to have no end of power, yet is refined and quiet when cruising. The build quality is excellent, as one would expect from Jaguar, as was the service I received at the dealership. Only had the car for a little over a week but very happy so far. This is my first XF and I am not disappointed. I have a 2.2d 200bhp Sports Model and the overall package of styling, equipment and performance is very good, harking back to the Jaguar Legend of 'Grace, Pace and Space'. The equipment level is very high and the interior feels quality from start to finish, the Sports finish provides a contemporary interpretation of the expected standard of Wood and Leather within the cabin. The handling and grip is assured, the car can pitch into corners without any unnecessary roll and feels in complete contact with the road at all times. The performance is also very good - the engine is quiet and smooth when idling, and torque/acceleration is pleasantly surprising when you put your right foot down. My 4th Jag, and I continue to be a very satisfied customer, thanks to staff at Grange Brentwood. Service and handover was first class. 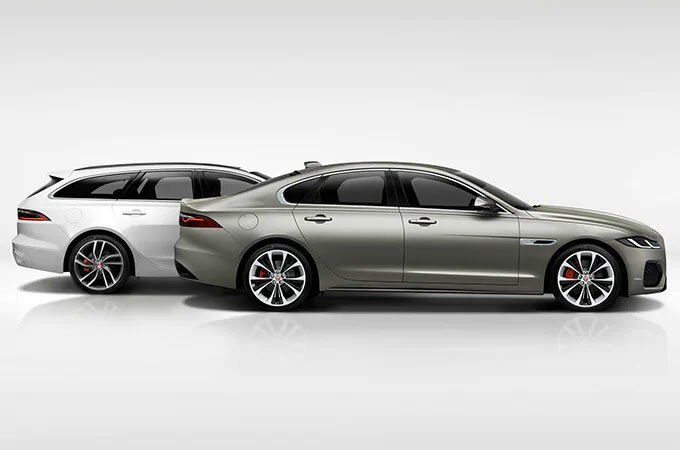 The Jaguar XF Sportbrake is the ideal vehicle for my needs. The Ingenium 2.0 litre Turbocharged Petrol 250PS automatic, together with the three drive options, performs as good, if not better than any Jaguar that I have previously owned which have had much larger engines. Its smart lines and good looks gets it noticed and admired. The interior trim and upholstery are well designed and in keeping with Jaguar tradition. The equipment performs well, and everything you need to be aware of while driving is presented in the centre of the dash board between the analogue dials, very useful. The large load space can accommodate a dismantled mobility scooter or wheelchair with ease without the need to lower the rear seats. A good all-round vehicle for the Jaguar driver with the need for carryability.